Special Advertising Section Short-stay Rehab Improves Recovery Few of us anticipate an injury or surgery that can require weeks, or even months, of rehabilitation after a trip to the hospital. But every year, millions of Americans experience a fall or require rehabilitation after a scheduled joint replacement. 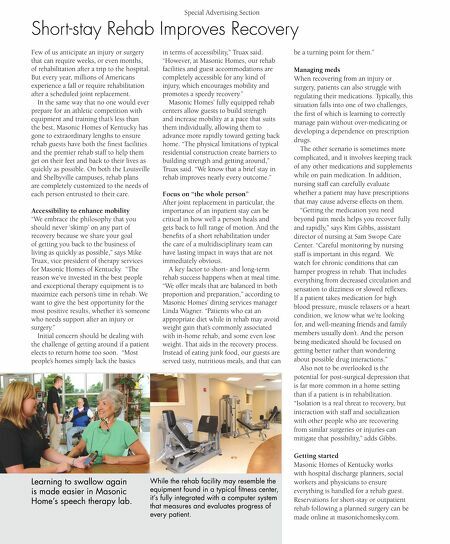 In the same way that no one would ever prepare for an athletic competition with equipment and training that's less than the best, Masonic Homes of Kentucky has gone to extraordinary lengths to ensure rehab guests have both the fnest facilities and the premier rehab staff to help them get on their feet and back to their lives as quickly as possible. On both the Louisville and Shelbyville campuses, rehab plans are completely customized to the needs of each person entrusted to their care. 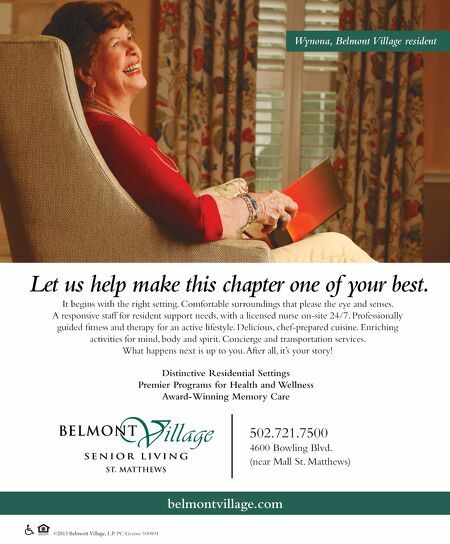 Accessibility to enhance mobility "We embrace the philosophy that you should never 'skimp' on any part of recovery because we share your goal of getting you back to the business of living as quickly as possible," says Mike Truax, vice president of therapy services for Masonic Homes of Kentucky. "The reason we've invested in the best people and exceptional therapy equipment is to maximize each person's time in rehab. We want to give the best opportunity for the most positive results, whether it's someone who needs support after an injury or surgery." Initial concern should be dealing with the challenge of getting around if a patient elects to return home too soon. "Most people's homes simply lack the basics Learning to swallow again is made easier in Masonic Home's speech therapy lab. in terms of accessibility," Truax said. "However, at Masonic Homes, our rehab facilities and guest accommodations are completely accessible for any kind of injury, which encourages mobility and promotes a speedy recovery." Masonic Homes' fully equipped rehab centers allow guests to build strength and increase mobility at a pace that suits them individually, allowing them to advance more rapidly toward getting back home. "The physical limitations of typical residential construction create barriers to building strength and getting around," Truax said. "We know that a brief stay in rehab improves nearly every outcome." Focus on "the whole person" After joint replacement in particular, the importance of an inpatient stay can be critical in how well a person heals and gets back to full range of motion. And the benefts of a short rehabilitation under the care of a multidisciplinary team can have lasting impact in ways that are not immediately obvious. A key factor to short- and long-term rehab success happens when at meal time. "We offer meals that are balanced in both proportion and preparation," according to Masonic Homes' dining services manager Linda Wagner. "Patients who eat an appropriate diet while in rehab may avoid weight gain that's commonly associated with in-home rehab, and some even lose weight. That aids in the recovery process. Instead of eating junk food, our guests are served tasty, nutritious meals, and that can While the rehab facility may resemble the equipment found in a typical ftness center, it's fully integrated with a computer system that measures and evaluates progress of every patient. be a turning point for them." Managing meds When recovering from an injury or surgery, patients can also struggle with regulating their medications. Typically, this situation falls into one of two challenges, the frst of which is learning to correctly manage pain without over-medicating or developing a dependence on prescription drugs. The other scenario is sometimes more complicated, and it involves keeping track of any other medications and supplements while on pain medication. In addition, nursing staff can carefully evaluate whether a patient may have prescriptions that may cause adverse effects on them. "Getting the medication you need beyond pain meds helps you recover fully and rapidly," says Kim Gibbs, assistant director of nursing at Sam Swope Care Center. "Careful monitoring by nursing staff is important in this regard. We watch for chronic conditions that can hamper progress in rehab. That includes everything from decreased circulation and sensation to dizziness or slowed refexes. If a patient takes medication for high blood pressure, muscle relaxers or a heart condition, we know what we're looking for, and well-meaning friends and family members usually don't. And the person being medicated should be focused on getting better rather than wondering about possible drug interactions." Also not to be overlooked is the potential for post-surgical depression that is far more common in a home setting than if a patient is in rehabilitation. "Isolation is a real threat to recovery, but interaction with staff and socialization with other people who are recovering from similar surgeries or injuries can mitigate that possibility," adds Gibbs. Getting started Masonic Homes of Kentucky works with hospital discharge planners, social workers and physicians to ensure everything is handled for a rehab guest. Reservations for short-stay or outpatient rehab following a planned surgery can be made online at masonichomesky.com.